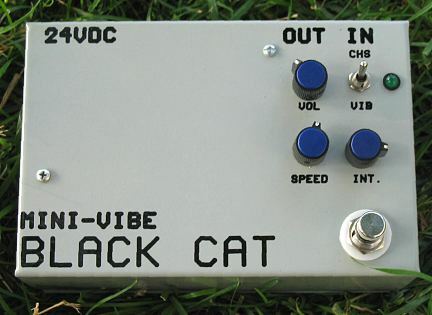 Not all Black Cat pedals are available yet, this is one of the old ones. Analog Man carried the Black Cat Mini Vibe. The same size as the Bass Octave Fuzz (4" x 6"), but sideways, this is a smaller version of the Black Cat Vibe. It does not have the CV jack for speed control, it is not an option, but it sounds great! The same size as the Bass Octave Fuzz (4" x 6"), but sideways, this is a smaller version of the Black Cat Vibe. It does not have the CV jack for speed control, it is not an option. But it's pretty small and sounds great, comes with a 24Vdc adaptor. You can use the EH deluxe memory man adaptor but the center plug is smaller.